Autumn = EVERYTHING pumpkin spice! 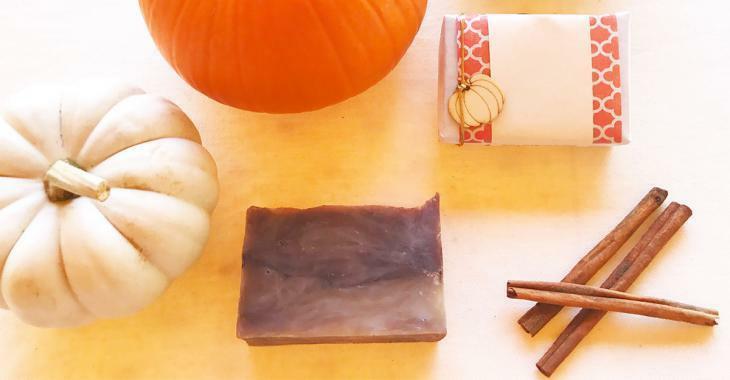 Whether you are a fan of the famous latte or your even your bff, we have a very easy DIY soap making project for you using essential oils. A great gift idea or for you to enjoy yourself! This recipe makes 4 bars of 4 oz soap. 1. First, cut the block of soap base into cubes of less than one cubic inch with a knife. 2. Put as many cubes as possible in your Pyrex cup and melt them for 30 seconds at a time, mixing well between each, until all your soap base is melted. 3. Add spices to the melted soap and mix to blend everything evenly. If you do not want small "seeds" of spices in your soap, you can run them through a sieve before mixing them with the soap. Personally, I like the exfoliating effect, so the texture does not bother me. 4. Add the cinnamon leaf essential oil and mix well. 5. Pour your mixture into your molds. You should be able to completely fill 4 4 ounce molds. To minimize the formation of bubbles in your soaps, you can put some rubbing alcohol on top. Let the soaps cool completely before unmolding. 6. Remove from the molds and enjoy your shower! If you want to make these to give as gifts, it's a good idea to create handmade labels or to print them, you can easily find them on Pinterest. Even if there is no pumpkin as such in the recipe, I promise you that the smell will make you think of your favorite latté! You can also add other essential oils according to your taste, for example orange would combine nicely with cinnamon. The turmeric mask: effective or not? For more content Fashion and Beauty, it's allright here.